Who are these guys? I suppose we will never know. This cabinet card photograph features two older men posing for their portrait at the Crane studio in Prairie City, Illinois. The men are pretty well dressed. Both are wearing long coats and hats. One imagines that this photograph was taken during the winter, judging by the men’s clothing. The gentleman on the right side of the image has an appearance of someone who likely did not live a traditional lifestyle. His appearance might have earned him a part in a movie about a wild man living a bit away from civilization. That is, if there were movies during the cabinet card era. Of course I realize that my hypothesis could be very wrong. As much as I love to conjecture about the people in these vintage photographs, I am clear that our interpretations may reveal more about ourselves than about the subjects in the images. These old photos can be similar to the projective tests (ie the Rorshach) employed by Psychologists. Gathering information about the photographer of this image was problematic. More thorough research could reap some very interesting results. The only photographer named Crane that I could find in the Prairie City area was Maria Ann Crane who operated a studio right in Prairie City. According to the Yale University library collection of “Women in Photography”, Miss Crane operated a studio in Prairie City in 1893. The library collection includes two of her portraits. Crane may have been an independent photographer, or like many other pioneer women in photography, she may have joined or succeeded her husband in the photography business. 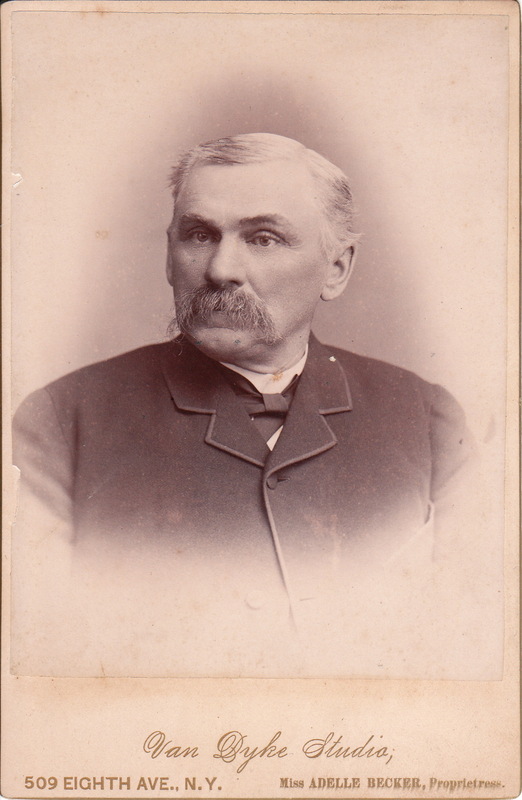 A older gentleman with a bushy mustache poses for his photograph at the Van Dyke Studio in New York City. 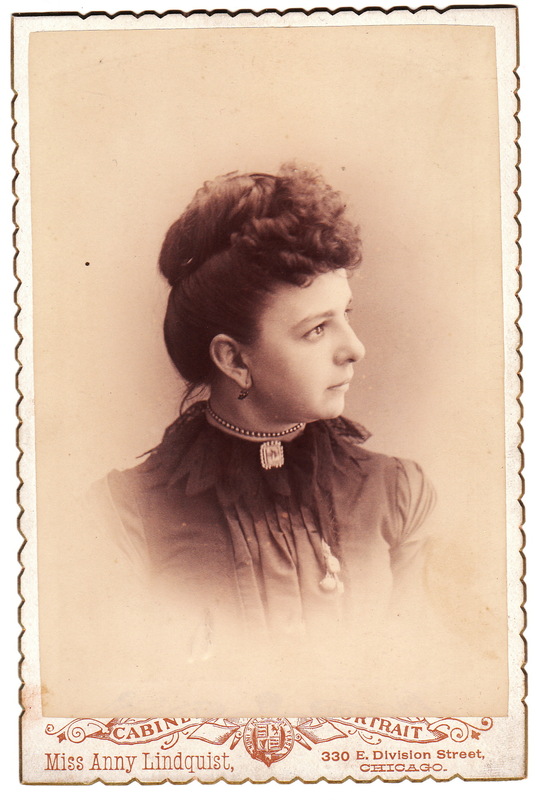 Printing on the front of the cabinet card indicates that the owner and operator of the studio was Miss Adele Becker. A female owner of a photography studio was a bit unusual during the cabinet card era but the cabinet card gallery has developed a collection of cabinet cards produced by female photographers. Click on the category “Female Photographers”. In regard to Miss Becker, research yielded little information about her life or career. It is likely she bought the studio from Mr. Van Dyke. This cabinet card captures a profile portrait of a young woman wearing a necklace and pin (possibly a cameo) on her collar. The noteworthy feature of this cabinet card is that the photographer is a woman, Miss Anny Lindquist whose studio was located in Chicago, Illinois. 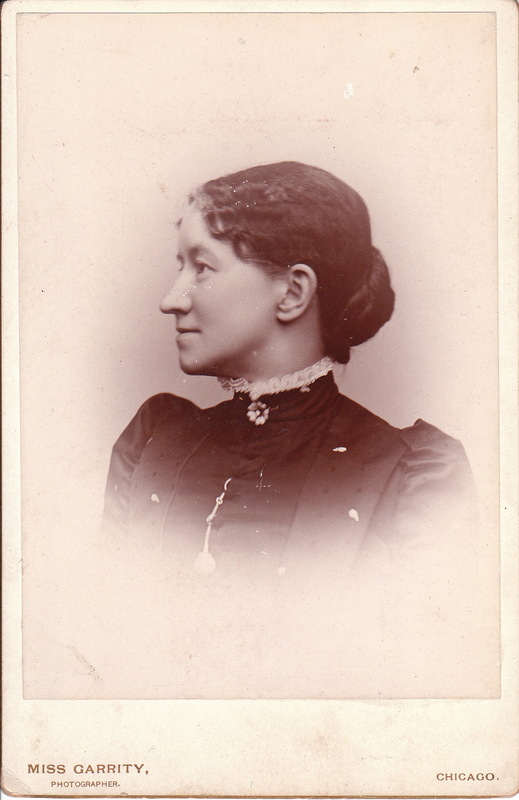 This cabinet card is a very ordinary profile portrait of a middle aged woman. She is nicely dressed in a high collar dress with lace trim. 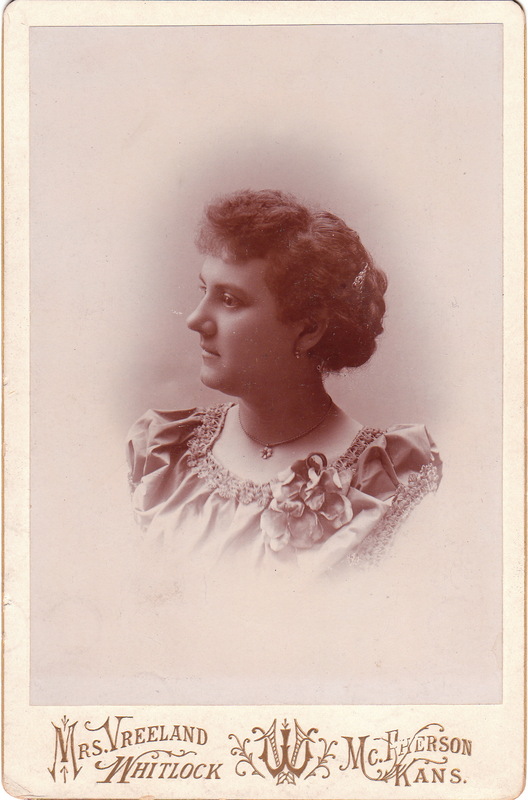 The only thing remarkable about this cabinet card is that the photographer, Miss Garrity, is a woman. Miss Garrity’s studio was located in Chicago, Illinois. To see other photographs by this photographer; click on the category “Photographer: Garrity”. Mrs. Vreeland Whitlock photographed this cabinet card in 1893. Whitlock’s studio was located in McPherson, Kansas. Her subject is a young woman wearing a corsage, necklace, earrings, and a hair clip. The images of other female photographers can be viewed by clicking on the category “Female Photographers”. To view other photographs by Mrs Vreeland Whitlock, click on the cabient card gallery “Photographer: Vreeland”. An attractive woman poses for her portrait at the studio of Misses Garrity in Chicago, Illinois. 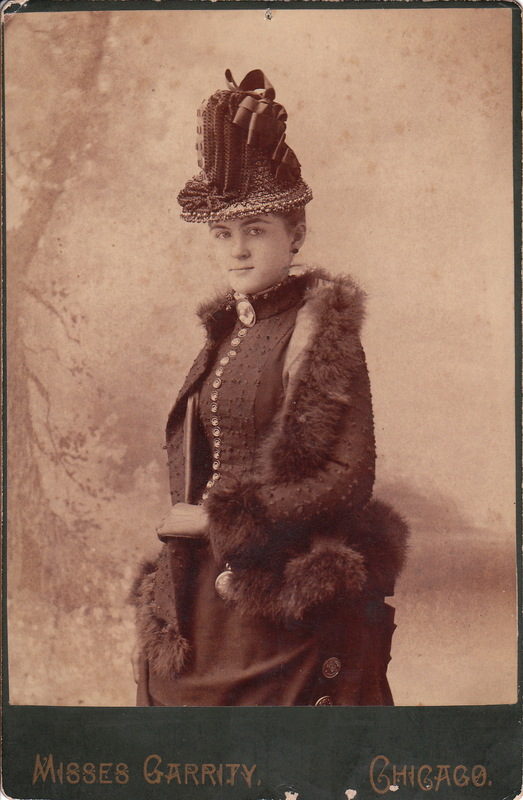 She is wearing a terrific hat, a fur collared coat, gloves, as well as ribbons, cameo collar pin and earrings. She is a stunning woman and is wearing the best finery of the day. Mrs Garrity’s studio was located at the corner of Clark and Elm Streets. Sallie E. Garrity was one of a number of outstanding early female photographers whose marriage stifled a successful career. She opened her first public studio in Louisville, Kentucky, in 1886. She later opened a large and successful photography business in Chicago. In 1893, while working at the Chicago Exposition, she met a man who “wooed her away from Chicago and Photography to Los Angeles and matrimony”. To view other photographs by Miss Garrity, click on the category “Photographer: Garrity”.